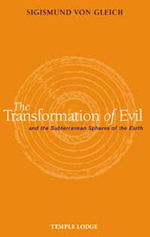 Written in the years immediately following the Second World War, this brief booklet is a powerful meditation on evil and its eventual transformation. Focusing on the realm of 'sub-nature' or 'the subterranean spheres', Gleich shows how the various layers of the earth's interior are intimately linked with the mystery of evil. The author begins by summarizing the classical picture of the Underworld derived from Greek mythology. He then characterizes the various qualities of the nine layers of the earth as described by Rudolf Steiner. Finally, he outlines the counter-impulses - the forces of 'good' - that work in polarity to the nine currents of evil harboured within the earth. Although written over 50 years ago, von Gleich's thoughts are more relevant today than ever, given that humanity is surrounded by problems of war, violence, starvation, greed, and an increasingly rampant and obtrusive technology. In his newly written introduction Paul V. O'Leary places von Gleich's work in a modern context. SIGISMUND VON GLEICH was born in Germany in 1896. While serving in the army he became ill with lung disease, and during convalescence was given a book by Rudolf Steiner. He was soon immersed in Steiner's philosophy, and became one of the most prolific lecturers and writers in the early years of the anthroposophical movement. Having fled Nazi Germany in 1936, he died in Holland in 1953.